Plot Outline: A live Cirque du Soleil performance featuring remixed music, visuals, musicians, singers, and dancers. Delirium is the quest for balance in a world increasingly out of sync with reality. 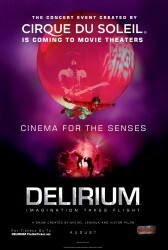 Delirium is an urban tale, a mix of music, dance, theater, and multimedia.